1976 SAN MARINO - Natale dittico dipinti del Tiziano (Cat. Unif/Sassone N° 973/974 - Yvert. N° 928/929) Serie completa di 2 valori Nuovi gomma integra in quartina. 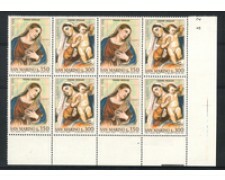 1976 San Marino - Christmas paintings by Titian - Complete Series 2 new values ​​MNH - for two - block of four. 1976 - SAN MARINO - NATALE DITTICO DIPINTI DEL TIZIANO (UNIF.SASS. 973/974 - YVERT. 928/929) NUOVI GOMMA INTEGRA ORIGINALE. 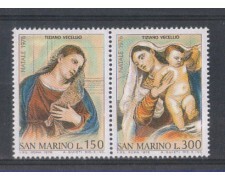 1976 San Marino - Christmas paintings by Titian - Complete Series 2 new values ​​MNH - paired. 1976 - SAN MARINO - ESPOSIZIONE FILATELICA ITALIA 76 (UNIF/SASS.970) NUOVO GOMMA INTEGRA ORIGINALE. 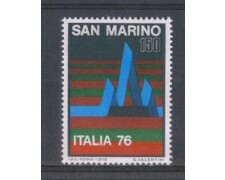 1976 - LOTTO/7970 - SAN MARINO - U.N.E.S.C.O. 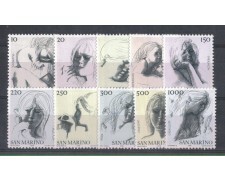 1976 - SAN MARINO - 30° ANNIVERSARIO U.N.E.S.C.O (UNIF.SASS.971/972) SERIE COMPLETA 2v. NUOVI GOMMA INTEGRA ORIGINALE. 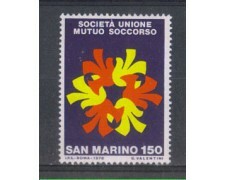 1976 - SAN MARINO - CENTENARIO DELLA SOCIETA' DI MUTUO SOCCORSO (UNIF/SASS.969) NUOVO GOMMA INTEGRA ORIGINALE. 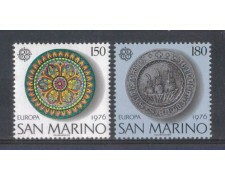 1976 - SAN MARINO - EUROPA ATTIVITA' ARTIGIANALI (UNIF.SASS.967/968) SERIE COMPLETA 2v. NUOVI GOMMA INTEGRA ORIGINALE. 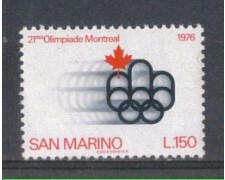 1976 - SAN MARINO - OLIMPIADE DI MONTREAL (UNIF/SASS.966) NUOVO GOMMA INTEGRA ORIGINALE. 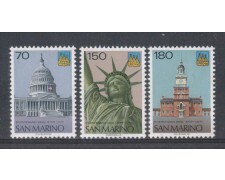 1976 - SAN MARINO - BICENTENARIO DEGLI STATI UNITI (UNIF.SASS.963/965) SERIE COMPLETA 3v. NUOVI GOMMA INTEGRA ORIGINALE. 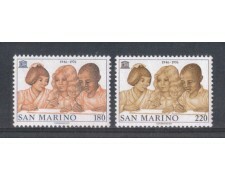 1976 - SAN MARINO - LE VIRTU' CIVILI (UNIF.SASS.953/962) SERIE COMPLETA 10v. NUOVI GOMMA INTEGRA ORIGINALE.